This is one of our favorite promotional mint tins. 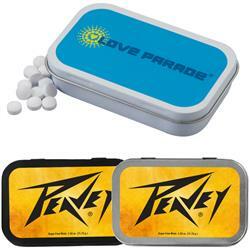 Large Rectangular Hinged Mint Tin - great as a handy giveaway during tradeshows, conferences and fundraisers. Add your company's logo to this 3 3/4" x 2 3/8" x 3/4" product for an excellent opportunity to promote your business. The mints are sugar free and gluten free. Made in USA mints. 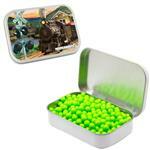 Our favorite promotional mint tin! Dimensions: 3 3/4" x 2 3/8"
Full Color Label. Label can be clear for direct imprint look.